A very good less sandbagged V7 my friend Ryan Young set recently with a new ETCH pinch we got more recently than I have a picture of. 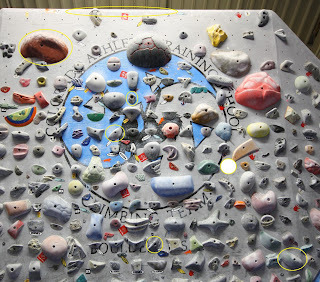 Consisting mostly of a little power and a decent amount of tension, I did not think this was too cruxy of a climb, but people say the second move is the crux. Here is the video: http://vimeo.com/6548936 where my feet cut on the second move where they did not when I first did this problem, and most definitely should not. But oh well. Here also is a picture of the top, 2nd move on (the filled in circle is where there is now an amazing ETCH pinch). You start on the large Hudz plate right before the floor goes down hill with the red spike jib, reach out to a good white E-Grips Comfy crimp, handfoot, and come into the green pinch pictured.